Admire as maravilhas naturais das Montanhas Azuis, listadas pela UNESCO, nesta excursão de um dia saindo de Sydney, incluindo traslado do hotel e transporte de ônibus de ida e volta. 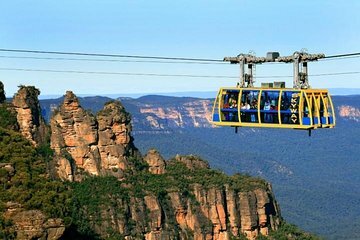 Faça uma visita à aldeia de Leura, aprecie as vistas das Três Irmãs de Echo Point e viaje no teleférico Scenic e no teleférico Skyway (por conta do visitante) no Scenic World. Após o almoço (não incluído), aproxime-se de animais australianos icônicos como coalas, cangurus e emas no Featherdale Wildlife Park. Amazing tour to the Blue mountain, fantastic view shared by our guide John. Excellent tour, was everything we hoped for and more. We had a great day with a wonderful coach driver. Would have liked more time to walk through the park areas but you can't do everything! This was a wonderful day tour! The guide was excellent! We had free time to explore Scenic World and the Wildlife Park on our own. I would like to have had more time for each, but there wasn't enough hours in the day to do that. I got to see most of it and I didn't have to drive. I recommend this tour!